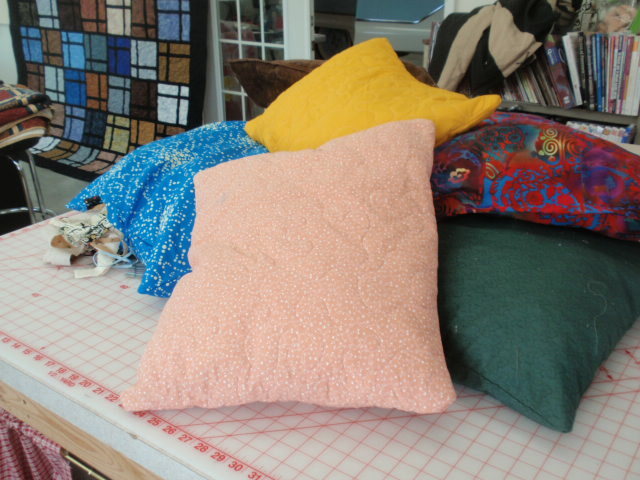 You can use an old pillow case & fill it 1/2 full and then stitch it shut. Or check with them to see if they have a specific size they prefer. I just use old christmas fabrics to make a sack & pin it to the arms of my sewing chair and all cotton fabric scraps go into it. It takes alot of scraps to make them nice & full. don't they get very lumpy when washed? I would think a mix with batting scraps would be better. I would mix them with a bag of fiberfill to lighten it up, but it's a good idea. Just the same as donations for human uses, when making plans to donate to animal shelters, you really should talk with the Coordinators. Each location may have varying requirements as to what is acceptable ....... or not! I'm sure you want to make something that is usable, than to show up to donate and be told NO! The shelter called me at one time and said they didn't want them anymore because they were too hard to wash. I suggested they just send the pillow home with the adopted pet. They love that idea because them the animal is taking something with them that has their scent on it. The shelter loves to see me pull up. I take an average of 4 pillows a month to them. Here is a picture of the pillows I took in a few weeks ago. Please don't throw them away... I would love to pay for the postage.. I am in need of different pieces, as I am making a postage stamp quilt that has 1.5" pieces.. I wouldn't hesitate to ship extras to others that are doing the same.. Pass the word on. There are about 20 of us that are involved in a swap, and I'm sure others would be happy to receive them.. Yes.. The dogs would also appreciate beds, too.. I have thicker fabric that you might be able to use..